Well over a year ago, I created a chart using Logos Bible Software that showed how similar the ESV & NRSV were in relation to the NIV, TNIV and the NLT. 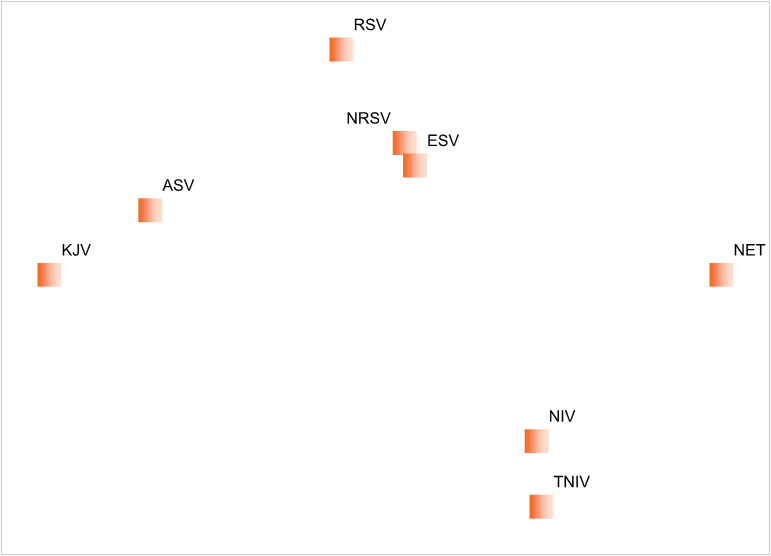 Since then, with all the discussion about the ESV, I’ve created a new one that looks at how similar the ESV, NRSV, and RSV are to each other. In order to show the relationship more clearly, I’ve also included seven other Bibles, including the ASV & KJV. In order to see more clearly, how similar the NRSV is to the ESV, I’ve included both the TNIV & the NIV, which differ by 4.2% through the entire Bible, though some books more and other less (Proverbs was changed by more than 15%). What amazes me is that the ESV is closer to the NRSV than the TNIV is to the NIV! How does this comparison work? and is there any significance to the axes? As I understand it, there isn’t any significance as to whether a translation is on the left or right necessarily. They’re organized based on their relationships to each other rather than to a specific base. hard to tell, they both look like they are pretty close. I don’t really understand why you think so. It’s seems perfectly clear. The way I understand it is that the baseline translation is the NRSV as it takes into account the most recent archaeological discoveries of ancient texts. Accepting the NRSV as the new baseline and the foundation for a modern, updated and most accurate translation of the original text, it shows us where the other translations fall in relation to accuracy of translation of the original texts. If indeed the NRSV is the most accurate translation of the original texts, then it is easy to understand where the others fall in relation to completeness and accuracy. However, acceptance of the NRSV as the most accurate translation available, is key to understanding this diagram. If one does not accept the NRSV as the most accurate translation then one must provide another translation as a baseline and present a case as to why its translation should be considered more accurate than the NRSV. This chart has been very helpful. Nope. There is no baseline. There is not standard by which all others are related. These are total weighted relationships independent of a baseline. Also, The NRSV certainly is not the most accurate translation. You’re just making things up.